Brides and contractors reached out to Call 6 Investigates Kara Kenney for help in getting their money back and to get the word out about Karen Hall. 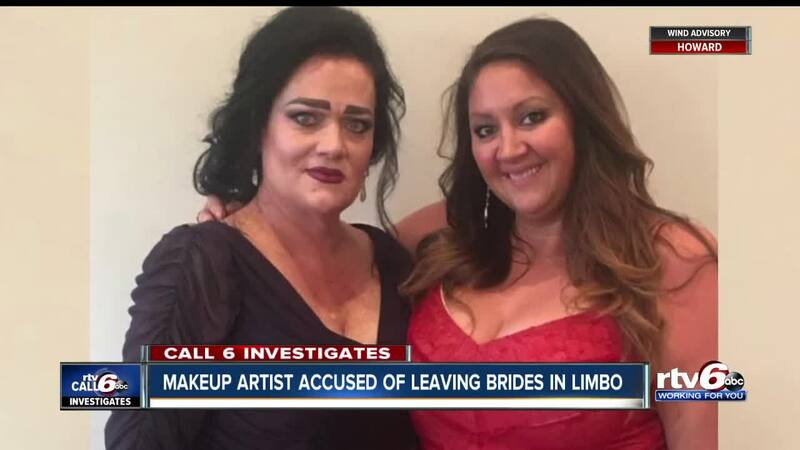 FISHERS — A Fishers-based makeup artist is accused of taking money from brides and not doing the work promised on their wedding days, as well as not paying employees who worked for her. Call 6 Investigates is working to get answers from Karen Hall, a wedding make-up artist whose Karen Hall & Co storefront was once located at 9943 Allisonville Road in Fishers. Brides and contractors reached out to Call 6 Investigates Kara Kenney for help in getting their money back and to get the word out about Hall. For many people, their wedding day is the biggest day of their lives and brides want to look their best, which is why many brides hire a makeup artist. Katharine Khamutov hired Karen Hall for her June 23 wedding at the Ritz Charles in Carmel, after the makeup artist appeared on the venue’s approved vendor list. Khamutov said she paid $915 for herself and four bridesmaids. But come the day of the wedding, Khamutov said her makeup artist Karen Hall did not show up. Khamutov said her mom’s best friend ended up doing her makeup. “It was more stressful than it was happy that morning,” she said. Sarah Corwin, a bride from West Lafayette, had a similar experience with Hall after finding her on a popular wedding website. Five days before Sept. 2, 2018 wedding, Corwin received an email from Hall saying she dissolved her business. The email said Hall could not fulfill any contracted service work. Corwin said she was very upset after reading the email. Corwin said Hall owes her $1,500 for work never performed. She said the makeup artist responded with half a dozen makeup artists she could use for her wedding, which was just days away. Hall’s email said she shared information with fellow vendors to help resolve brides’ needs. Brides are not the only ones who say Hall owes them money. Danie Patterson and Leanna Grinsell worked for Karen Hall doing hair and makeup, but the contractors said they weren’t paid for hundreds of hours’ worth of work. Patterson and Grinsell went to court and got nearly $10,000 in judgments against Hall, a woman they considered a friend. Patterson received a $5,611 judgment against Karen Hall and Company LLC in Hamilton County Superior Court. Grinsell obtained a $3,985 judgment against Karen Hall & Co in Johnson County Superior Court. The Indiana Department of Labor declined to investigate because they were independent contractors, not employees. Call 6 Investigates tried emailing Karen Hall and contacting her attorney, Randall Cloe, however we did not hear back from Hall. Call 6 Investigates stopped by Hall’s Allisonville road location, and it is now closed. So, Call 6 Investigates Kara Kenney showed up to a Nov. 26 hearing for Hall’s apartment complex evicting her. Hall dodged our cameras outside the court, and eventually emerged with court bailiffs by her side. Call 6: There are brides and contractors who say you owe them thousands of dollars. Are you going to pay people back? Call 6: What do you say to brides that say you canceled on them right before their wedding day. What do you want to say? As Hall drove away, she made an obscene gesture with her hands to the RTV6 camera. Khamutov and Corwin aren’t surprised by Hall's response. “It makes me feel like this woman really swindled people,” Khamutov said. Both brides said Hall did makeup trials before their weddings, but never performed services on their wedding days that she was paid to do. Corwin filed a complaint with the Indiana Attorney General. The office attempted to investigate and mediate Corwin’s complaint, but Hall did not honor any attempts to discuss the matter. Khamutov filed a dispute with her bank, however, she has not yet received her money back. Brides we spoke with said they did sign contracts with Karen Hall, however, those contracts were on her website which no longer exists.